Friday was my Lippincott, Hidden Valley, Hunter Mountain run.After a hearty breakfast at PSR I geared up and went over to the gas station to see how many people were going to join me on my Lippincott/Hunter Mountain trip. Randall and Gary decided to join up with us as his group ride fizzled and between him, myself, and the other riders we decided to reverse the planned route and go up Hunter Mountain and down Lippincott. I was okay with this as I really just wanted to bag Lippincott for the list and was perfectly happy going down instead of up. Joining Randall and I we had Gary, Russ (who I met the previous night in Darwin), Shridhar for the loop. The big bike subgroup, Sarath, Sachin, Vicram, and Ron joined up with plans to peel off at the Racetrack to return via Ubehebe Crater and Racetrack Road. 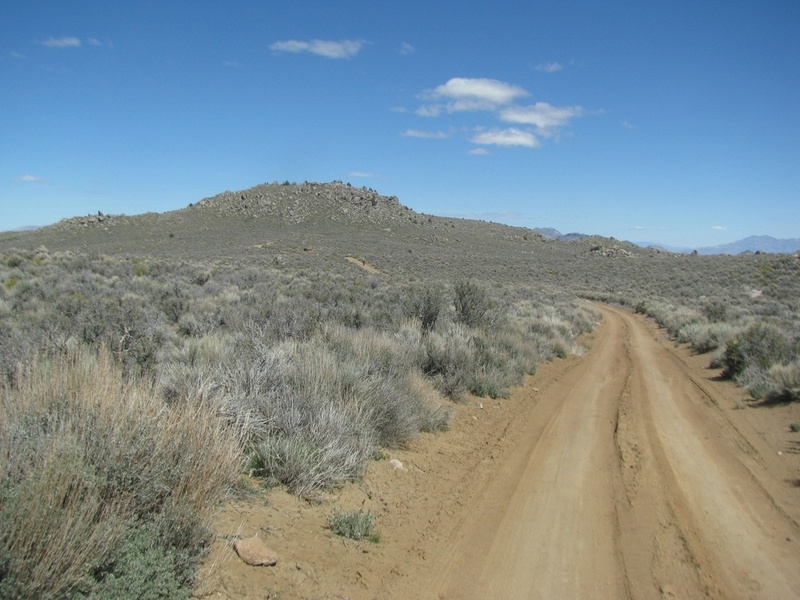 We all climbed onto the bikes and slabbed it out to Saline Valley Road. There we regrouped and waited for the dust from the last group to settle before we started on our way. Since Randall is more comfortable with riding at speed than me he took point while I ran sweep for most of the ride. As I rounded a corner I found that Sarath’s F800 washed out from under him. After a quick victory pose I helped him get it back on its feet, having flashbacks from the ill-fated 2015 Reward Mine trip. 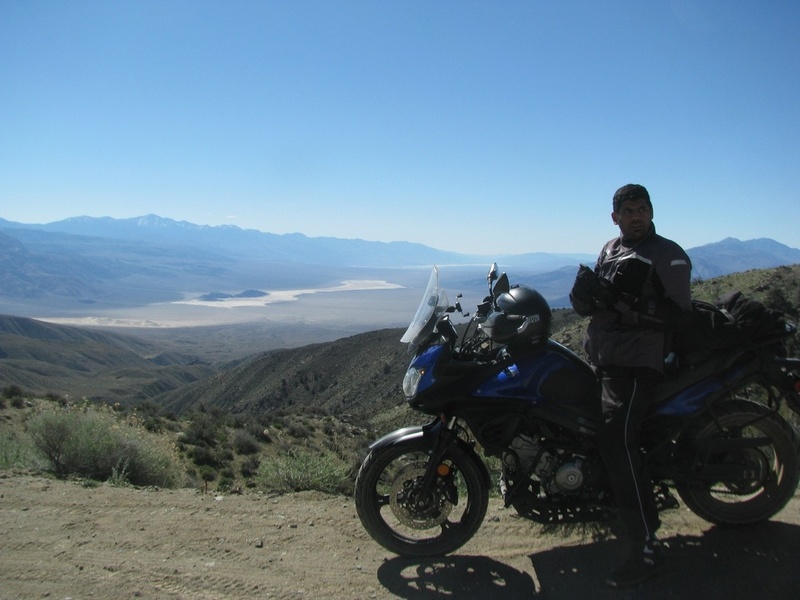 Vikram just after taking a photo of the view into Panamint Valley. 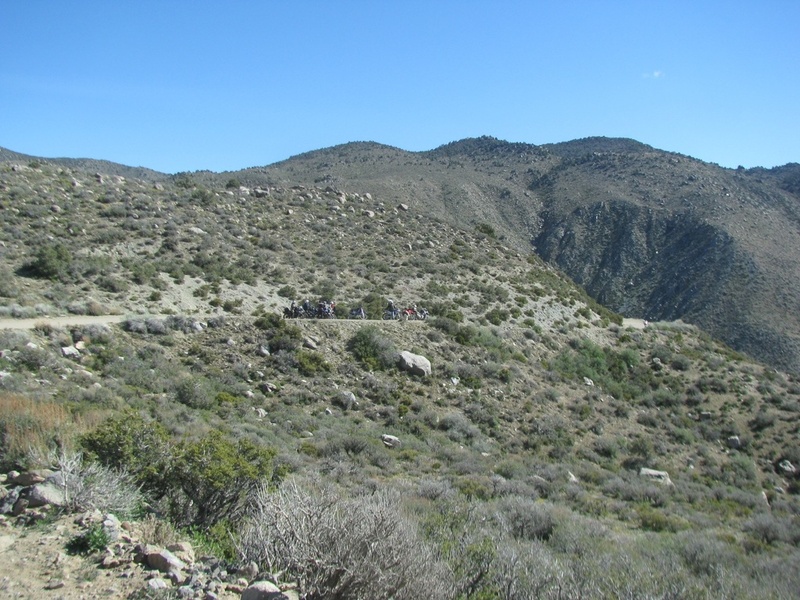 The group met up again at the Panamint Valley Overlook near South Pass and we decided to have Randall lead the faster group to Hunter cabin for lunch while I lead the slower group to the same. Sarath ended up being our new sweep and we made quick work of getting to Hunter Cabin. Where we all made the turn off leaving Sarath behind! When it came to my attention that Sarath didn’t make it in I geared up and took off trying to find him. I ran two miles further down the road to no avail so started to backtrack fearing he had trouble. I ran across a couple of KTM riders and they reported that they had found no stray F800. I asked them to keep an eye out for him and let him know we’re behind him then I returned to Hunter Cabin feeling a bit crummy. We quickly finished lunch, packed up, and got back on the trail to continue on and, hopefully, find our stray rider. About to drop into Hidden Valley. Vikram getting the job done. 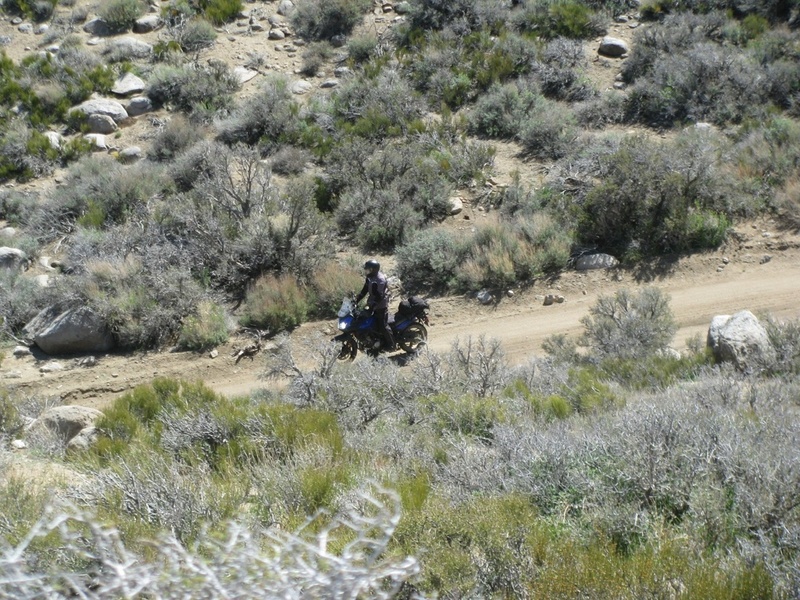 Shortly after we dropped into Hidden Valley I rode up on the group stopped. We had found our missing rider! There was much rejoicing. We all had a laugh and Sarath didn’t even punch me in the eye. We climbed back onto our noble steeds and continued on. 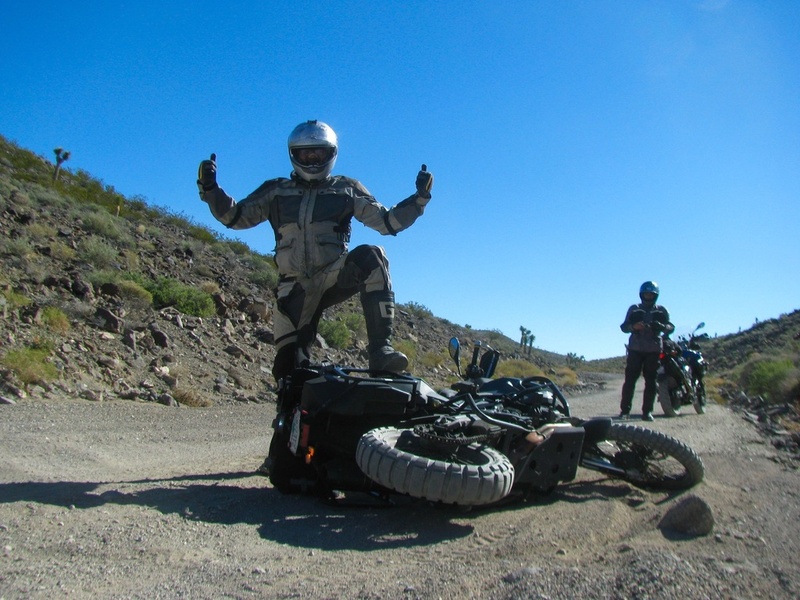 Things were going great, everybody was riding at a pace that worked for them and we were near the end of Hidden Valley about to get a photo-op at Teakettle Junction, things were going great.